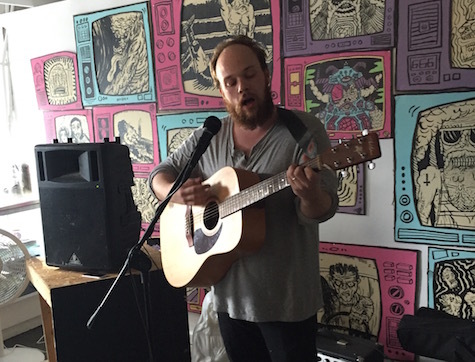 Sam Martin in the Sweatshop Gallery at Sweatfest, July 15, 2015. He’s playing tonight at O’Leaver’s. Word came this morning that singer/songwriter/producer Richard Swift passed away at the young age of 41. As a producer, Swift worked with Foxygen, Guster, Sharon Van Etten, Damien Jurado, Pure Bathing Culture, and Saddle Creek Records act The Mynabirds, having produced their first two albums. He also put out some great stuff of his own, such as Dressed Up for the Letdown (2007, Secretly Canadian), which I’ve been listening to this morning. He was definitely too young to go. More on his life and work at Pitchfork. For once someone booked some shows the night before a national holiday, which is sort of a no-duh kinda thing when you consider most of us have tomorrow off. Meanwhile, down at Slowdown Jr. Jeremy Enigk of Sunny Day Real Estate and The Fire Thief fame is doing a solo set with a full band. His last album, Ghosts, was released in 2017 on Lewis Hollow, but this tour celebrates his solo debut Return of the Frog King (1996, Sub Pop). Chris Staples (Twothirtyeight) opens. 8 p.m., $18. Finally, there’s a house show at 20th and Poppleton featuring D.C. indie rock act The Rememberables, who sound like they walked right out of the ’90s. Baltimore dark wave act Blacksage opens along with Haggis, CBN and Lifeguard. $10, 9 p.m.